Word had been out for some time now that Google was going to hold a press event. For what exeactly? No one was too sure. Some thought Google was going to unveil their much anticipated music service. Alas, no not yet. The Android market experienced an outage the night before the press event. Many waited for an ensuing market update. No go…or so they thought. Yesterday, Google held an Android press event on their campus to unveil a few goodies for us. Among the many things that Android Devs and others were showing off, two stood out: an online Android MArket and in app purchases. The focus for this post will be on the Android Market. Many (including myself) have been praying for an online market. I thought I even saw someone doing a type of rain dance to please the gods. Realistically, the demand for such a site has been high. Now Google has finally delivered. Upon entering the site, you are presented with a slider at the top of the homepage showing off some of the featured apps. Upon further investigation by scrolling down, apps are organized by featured, free, and paid along with best selling. To the left you can choose a category you would like to view to find your app of choice. To gain access to the site, just log in with your Google info that you use on you Android device. 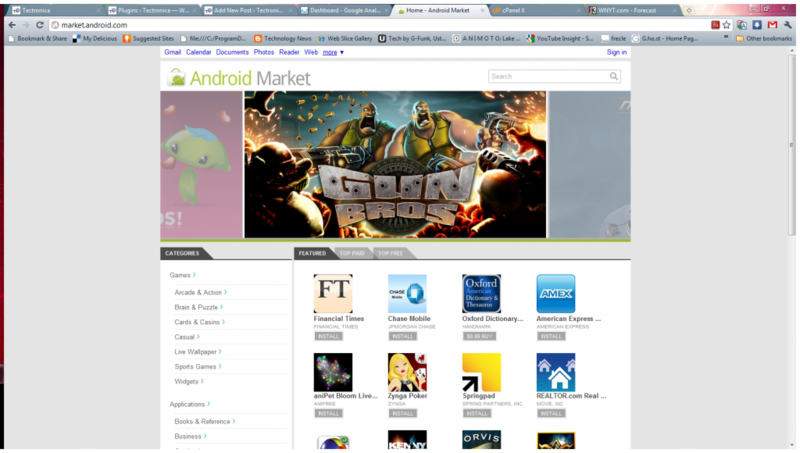 From there you can access the usual Google goodies along with you Market account. Now , the only thing left to do is to go and check the site our for yourself. Post you thoughts on the new online Android Market down below.